When the expression “Soundtrack composer” comes to mind, it’s hard not to think of Ennio Morricone at first thought. The “Maestro” built a body of work that is spread across more than 500 movies. The Rome born composer became notorious because of his works in Spaghetti Westerns, most notably his partnership with Sergio Leone, which reinvented the Western genre. Choosing a gritty, organic and sparse sound instead of exaggerated orchestrations of most Westerns traditional soundtracks, Morricone created his own style adding whips, gunshots, whistles and electric guitars to create a narrative element in music. Leone’s direction put Morricone’s music in the spotlight, as a fundamental protagonist of the narrative, serving as a rhetorical element to emphasize emotions and feelings that were not clear in a story starred by subtle, laconic heroes like Clint Eastwood. Long scenes featuring the music and close shots at the characters transformed some excerpts of the movies in a pre-form of a Video Clip, combining sound and vision in another level, adding significance and semiotic meaning to the images. Morricone’s influence on modern pop culture can be seem in the way soundtracks are perceived as a part of video creation, in works of Wong Kar-Wai and Quentin Tarantino, both of them using Morricone’s tracks as an important element of the movies. Separated from the movie, the music still has meaning to the listener. When somebody hears The Good, The Bad and The Ugly theme, a western movie automatically enter their minds. More than an element in the movie, Morricone’s music became a major role on a par with The Man with No Name. After graduating from a Music School in Italy, he worked for RAI (Italian State Broadcast channel) and produced works both in the Popular and Erudite world, composing for Italian popular artists (Rita Pavone, Gianni Morandi, Gino Paoli, amongst others) and playing the trumpet with the Gruppo di Improvvisazione di Nuova Consonanza, the first free form improvisation collective that worked avant-garde techniques by John Cage, Miles Davis’ electric jazz experimentations and robotic grooves similar to German Kraut Rock band Can. In the musical field, Morricone’s scores cover Classical, Pop and Avant-Garde. Elements like classical music orchestrations, catchy melodies, surf guitars, voice used as an instrument, Pan Flute, Jew’s harp, Ostinato and strange percussions became his trademarks. The Morricone Sound was born in The Dollars Trilogy, but went beyond any limit of music or film genre, displaying an eclecticism that influenced a generation of musicians like Yo-Yo Ma, Hans Zimmer, John Zorn, Mike Patton and rock bands like Muse, Pixies, Metallica and Primus. This movie was groundbreaking for Spaghetti Westerns. Leone’s violent and cynical camera gave birth to two legends: Clint Eastwood and Ennio Morricone. 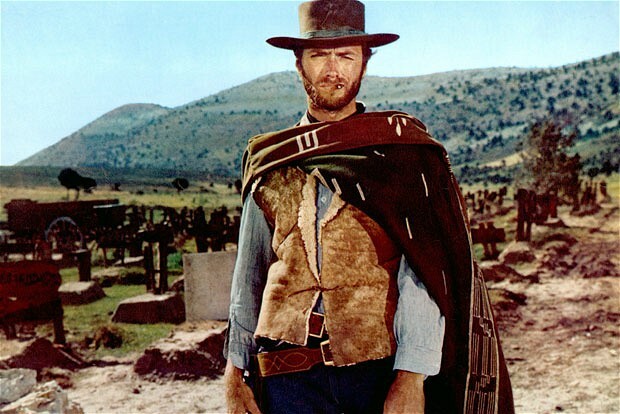 Eastwood based a career on his The Man With No Name character and Morricone became the official Spaghetti Western soundtrack composer after the movie. The movie is loosely based on Akira’s Kurosawa Yojimbo, which had an amazing soundtrack composed by Masaru Sato, a result of a combination between Western music and Henry Mancini. Mixture was also the formula for Morricone’s soundtrack, which transformed an arrangement made by Morricone himself to Peter Tavis sing Woody Guthrie’s “Pastures of plenty” into a Movie Theme. Leone hired Morricone, who had worked as a soundtrack composer in some westerns before. He knew Morricone since childhood (both studied at the same school), and the partnership extended until his last movie. A Fistful of Dollars was a box-office success with the public and started an era for Spaghetti Westerns genre and Morricone’s soundtracks. Western movies after A Fistful of Dollars had two options: hire Morricone or hire someone to make a Soundtrack that Morricone would make. Luis Bacalov’s famous Django theme (Django,1966, directed by Sergio Corbucci) can be said as one example. In Quentin Tarantino’s Django Unchained, Bacalov’s song is side by side with Morricone’s tracks on the soundtrack. Having low budget to compose the tracks, the Italian composer replaced an Orchestra for juxtapositions of uncommon sounds, evoking the wilderness in the scenario. The theme seemed to carry, in the form of galloping drums, the bravery and cunning necessary to survive in a world like that. His first work with Gillo Pontecorvo, this score is manly formed by Military March drum snares, serving as a background for a piano and brass instruments that alternate in a growing tension evoking the clash between the French Army and National Liberation Front (FNL). The soundtrack is composed by different pieces of music, including pieces influenced by Arabic music like “Ali’s theme”. The curiosity here is the fact that Morricone composed the soundtrack together with Pontecorvo, which was a contract clause. This work expanded Morricone’s musical horizon, showing that he was not limited to Western Spaghetti’s clichés, producing a soundtrack that was filled with different elements and moods: seriousness and climatic tension produced by repeated notes on a piano dialoguing with trumpets. The main theme is not as sparse as his Western Spaghetti’s soundtrack, but dense and loaded with intensity at every moment. The marching drums are protagonists both at the beginning and end of the song, evoking the Military tone of the movie and the highly-charged atmosphere. The Theme Song from the movie was later used in Quentin Tarantino’s “Inglorious Bastards”, in the scene where Brad Pitt rescues Sgt. Hug Stiglitz from a Nazi prison. Pontecorvo and Morricone later worked together in another political classic from the Italian director, “Queimada!” starring Marlon Brando. The ultimate Spaghetti Western, this movie is recognized to be a masterpiece of cinema, carrying the five stars necessary to validate a classic: Clint Eastwood, Lee Van Cleef, Eli Wallach, Leone’s camera and Morricone’s music. The film is considered to be the capolavoro of the Dollars Trilogy. Sergio Leone subverted the Western genre even more after A Fistful of Dollars and A Few Dollars More: the three protagonists are not plain heroes/villains, with only good or evil intentions. They vary according to the opportunity; even at War (the bridge explosion scene), they demonstrate individualistic traits and intentions. The Soundtrack contains two masterpieces instantly recognized by every movie fan: The Good, The Bad and The Ugly and The Ecstasy of Gold. The former is a classic Western Spaghetti composition with martial Drums alternating 3 and 2 hits, sounds emulating coyotes and a crescendo. The latter is an epic piece, used by Metallica for opening their shows, with a superb soprano apotheosis, dialoguing directly with the ecstasy of the three characters in finding the Gold. This cult western classic featured two elements from The Good The Bad and The Ugly: the Bad (a.k.a. Lee Van Cleef) and a Morricone score, based on elements similar to those present in Leone’s movie. A surf music guitar riff gives the tone to a beat that resembles a horse galloping. This movie’s title was used by John Zorn on his homage to Morricone “The Big Gundown”, a reinterpretation of Morricone’s works through the experimental lens of Zorn’s music. Two tracks from this movie became an entity themselves: The Theme Song and The Man with the Harmonica. The former is a divine melody played by violins that grows into a Soprano epic. The latter is a one key song played by a harmonica starting with the emptiness of the desert developing into a violent explosion. The song is the theme of Harmonica (Charles Bronson) and it is amazingly explored by Leone in the Bar Scene, when there is a shadow/light effect combining with the apotheosis of the song. British rock band Muse uses it as an opening for the track Knights of Cydonia, which is a Morricone influenced epic-rock. This score gave expression to the Morricone Gangster sound, later used in Once Upon a Time in America and The Untouchables. This one got him away from the Western Spaghetti sound and introduced his choice for traditional melody over unusual noises. The theme song is a classical music piece with a very distinguished melody all along the way, instead of the experimentations with noises and instruments from the Western Movies.